The complexity of the shelf, drawer, counter and window displays discussed in this text suggests that hardware selling was settled into forms unlikely to change: a lot of time and effort would have gone into building these fixtures, arranging these displays. And yet, and yet — things would change, and hardware retailing might have struggled to keep up, given the time/effort already sunk into fixed forms. The idea of a slot for every item, a perfect match of location and object, makes the store something like a catalogue of itself. Store as dictionary, a telegraphic code containing the molecules (and rules for their arrangements) of every possible expression, arranged in lists and tables, columns and rows. A dictionary of phrases, a lexicon of things: wanna build a message, we got it. wanna build a house, we got it. Practical realities, of course, would require additions and deletions, supplements giving way to entirely new editions every few years. There’s something in me, several generations later, that is moved by this interesting corner — its being a corner, the varieties of what it contains — nuts and bolts loose and boxed, etc. — the wrapping table with its two widths of wrapping paper (perfect for drawing on, by the way), its lamp. As with young children, there is a beneath or a behind to all things... When Walter Benjamin wrote his brief memoir of growing up in Berlin, he spoke of how children have a special knowledge of a home’s corners... (pp 57-58). Many references to corners in this wonderful book. 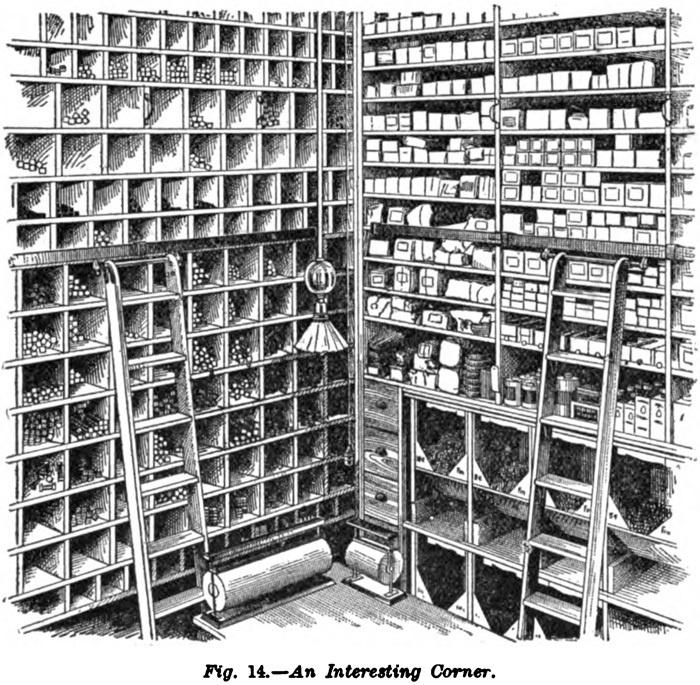 Another perfect arrangement — this one for literature — from the same author’s Hardware Store Business Methods (1901) *. It is in among my unevenly annotated directory of hardware store literature *. tags: arrangements; Benjamin, Walter; corners; fasteners; hardware; lexicon; Piper, Andrew; Williams, R. R.